With a bottom set Year 9 German class, we had watched the film ‘Lola rennt’ (Run Lola, run) and were using the perfect tense to describe what had happened in the film. We had spent quite a few lessons on this (it felt like an eternity!) and the class seemed to be getting it, slowly. They had started to adapt the sentences to say other things too The only problem was, they were getting really sick of it; any mention of the film title and their groans would fill the room! As I entered the classroom on this occasion, I had some exercises planned, some whiteboard activities, even a cartoon strip, but I must admit that even I was starting to grow weary. I spied a couple of bags of big ‘Mega Blox’ style building bricks that I had bought very cheap from Wilkinson at Christmas and on the spot I decided to change my plan and an idea started to grow! I asked them to write on their bricks with dry wipe marker, using one brick per word and see who could create the longest sentence and therefore, the tallest tower. 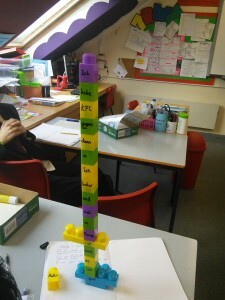 They had also just learnt how to use connectives, so their towers had the potential to grow to quite a height! They were mainly working in pairs (it is only a small class) and I dished out a handful of bricks per pair. Once they got going, they started to get quite competitive and almost forgot that there were creating quite long and complex German sentences in the past tense; something that causes headaches for quite a few pupils! They were even going around ‘borrowing’ bricks off each other to make their towers taller! The atmosphere was, although competitive, quite serene; you could almost hear the quite buzzing of busy brain cells. At the end of the activity, I took photos. The pupils were so proud of their towers that they asked me to wait until they had run out of bricks! On this occasion there was no prize. 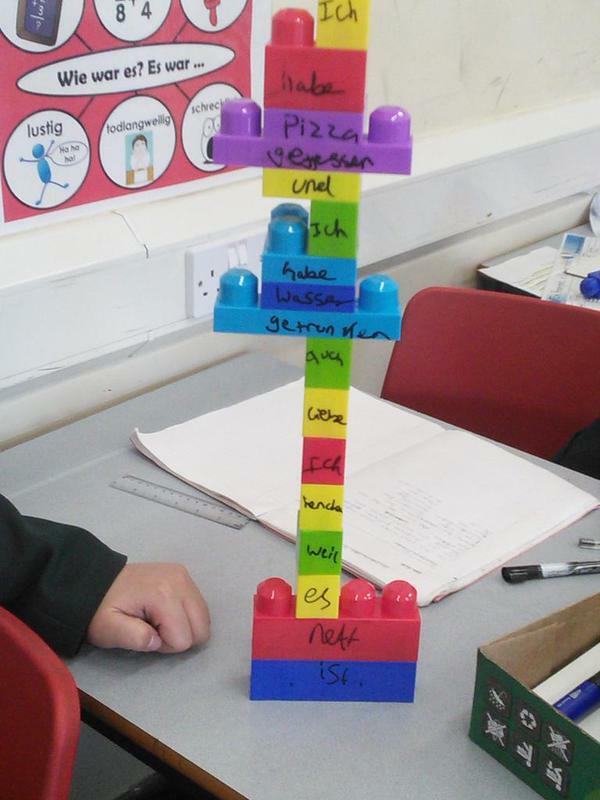 They were simply happy to have the glory of creating the tallest tower in the class, and in doing so, creating fantastic, complex past tense sentences. I learnt that you’ve sometimes just got to go with it; take a risk and wait to see what happens. Also, I learnt that you should keep your eyes peeled for cheap children’s toys; I’ve got quite a collection now! This entry was posted in Creativity, Ideas, Modern Languages and tagged activelearning, creativity, engage on February 12, 2015 by Rebecca Wylie.